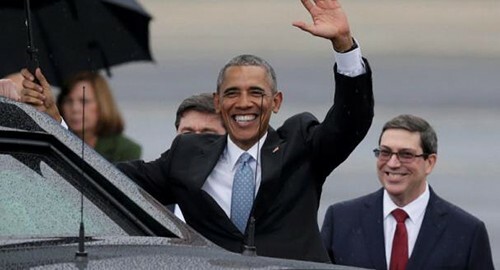 HAVANA – The Rolling Stones were meant to play a rock ‘n’ roll show in Havana on Sunday but were delayed five days because of the inconvenient arrival of another foreign visitor: U.S. President Barack Obama. Obama lands on Sunday for a 48-hour visit 15 months after he reversed more than half a century of U.S. policy on Cuba and started normalizing relations with the former Cold War adversary. The Stones’ Latin American tour happened to roughly coincide and the band was at first set to play Havana on Sunday, but organizers then learned of the Obama trip and postponed the show until Friday, the band’s production manager said. “At one point we thought he (Obama) was coming to the show,” Dale “Opie” Skjerseth told reporters on Saturday from the outdoor sports complex where the Stones will play. “He’s our opening act,” Skjerseth joked. The Stones added the free show to the end of a Latin American tour, becoming the first major international rock stars to play Cuba. “They like to be the first of everything,” Skjerseth said. “They figured they’d like to come here and give it (rock) to them,” Skjerseth said. Havana is preparing for Obama with an extraordinary street-paving campaign and restricting areas he will visit for security reasons. At the same time, the groundwork for the Stones production has also been impressive if not unprecedented for Cuba. The band brought in 61 shipping containers with an estimated 500 tonnes of equipment such as the stage, speakers, lights and video screens, Skjerseth said. A Boeing 747 arrived on Friday from Mexico carrying the last of the equipment, he said.